The objective of the Advanced Competition Pistol program is to refine and improve the student’s gun handling and precision speed shooting skills (as presented in our Practical Fundamentals Course) via immersion in a focused, high round count program of scored standard exercises and personalized off-line coaching. The student will be conducted through an intense, progressively challenging set of 16 different timed standard exercise drills, fired in rotating relays throughout the two day training period. Each successive cycle will be fired at progressively greater distances and/or smaller target areas each day out to 50 yards. These drills encompass the primary set of core practical pistol skills, including: time-pressure reloads, strong and support hand shooting, malfunction clearing using dummy rounds, multiple target engagements, movement to cover, barricade work and supported-position shooting. The second day will end with a tough, fun practical scenario to test your skills and your nerve. Prerequisites: Previous Practical Fundamentals attendance, or verifiable, safe practical pistol skills with a demonstrable understanding of proper trigger management and ability to shoot accurately. Equipment: A reliable and safe service pistol, and… Vertical-drop Kydex holster and multiple magazine pouches on a proper gun belt eight magazines (minimum) and magazine loading tool. Any USPSA holster/belt/magazine pouch set-up is acceptable. Cleaning kit and gun grease/lubricant. Eye protection, hat, sunscreen, hand towel. Well-fitting glove for support hand knee and elbow pads. Just to be clear on the concept, the objectives for this course are in stark contrast to the process and understanding-oriented Practical Fundamentals format. By nature it’s difficult for me to let people struggle, and indeed in our Practical Fundamentals course we won’t let our students fail. However, Jerry Jones has helped me to realize that we can’t grow our skills beyond our limits unless we know what those limits are. 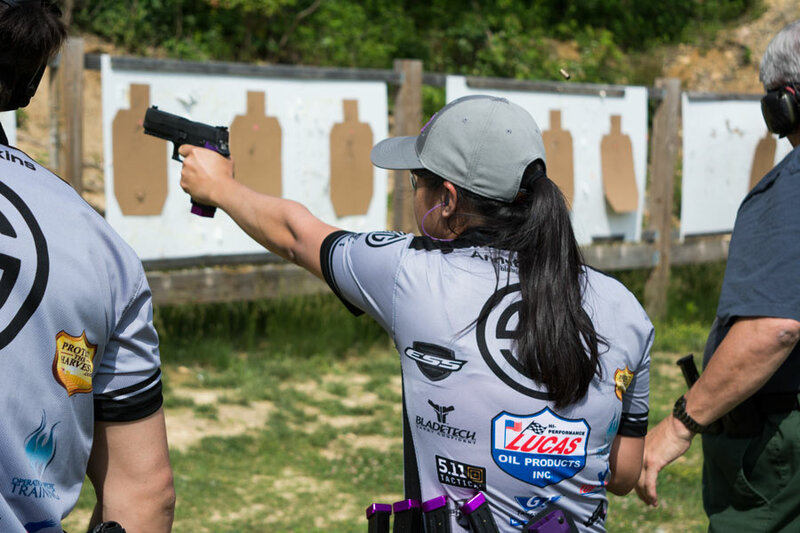 Our goal for the Advanced Competition Pistol course is to break your skills down to the failure point and then help you build them up to a higher level. You’ll find the course to be very different in feel and much more intensely focused than the previous advanced courses we’ve developed this from. About 1,500 rounds of ammunition. At least six to eight magazines for your pistol. At least four magazine carriers. The course fee for Advanced Competition Pistol class is $450, plus applicable range fees. Contact us for information on group rates.